Ann and I were both a little…heavier then. She is most definitely NOT taller than me — she was standing on a box. Capitol Records is on the left. The Hollywood sign can be seen on the right. I could never quite pull off wearing mirrorshades. We stopped here, where my brother was working at the time, to take a quick tour before walking a few blocks to the Pantages Theater to see The Phantom of the Opera for the umpteenth time (and by stating that, yes, I do know the whole thing by heart). If I remember correctly, we also chatted with the co-star of the show, Marie Danvers, in her rented Chevy Cavalier after the performance. It may not have been this time but we did in fact spend time with her and wow, she’s a fantastic, funny lady. Sadly, the building fell into a state of disrepair and is now slated to be converted into apartments, retail, and office spaces. And I can guarantee that at least one of those stores will be selling mirrorshades like mine – now considered “retro” and going for $250 a pair. 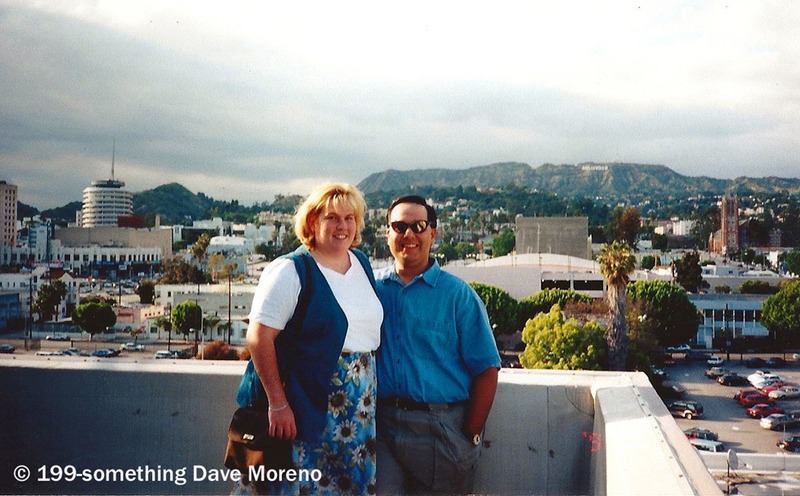 This entry was posted in 90s, Flashback, Photography, Throwback Thursday and tagged 90s, capitol records, CBS, columbia square, Flashback, hollywood, throwback thursday by Dave. Bookmark the permalink.